The volume of the speaker and microphone on a ProTalk door entry system can be easily modified to suit local conditions. Both adjustments will require the front cover of the door unit to be removed. If callers find it hard to hear you, adjust the volume trimmer dial which is towards the top left of the unit (see picture). There are two trimmers in this location, turn the bottom one to adjust the volume. Turn left to decrease the volume, and turn right to increase the volume. The top trimmer adjusts echo cancellation. 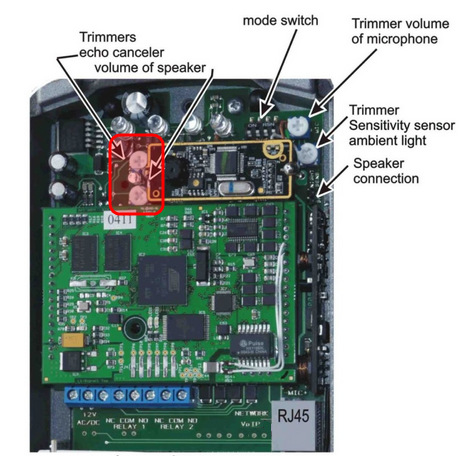 The unit automatically cuts off the microphone whilst the speaker is in use to avoid an echo. Tweak this trimmer as required for the optimum quality. If the voice of a caller at the door is too quiet or loud, adjust the microphone trimmer which is located in the top right hand corner of the unit (see picture). Adjust it to the left to reduce the volume, and to the right to increase the volume.